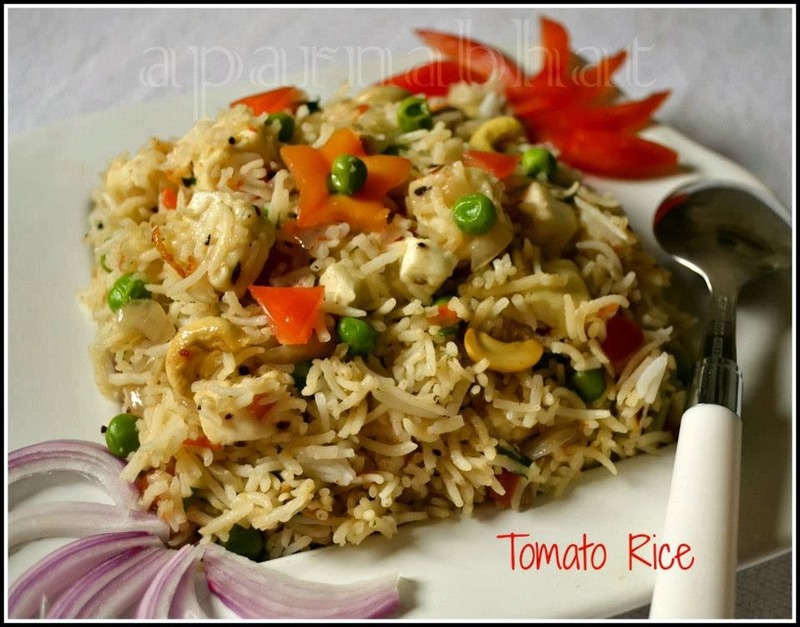 Tomato rice is the dish on my menu card whenever I am lazy to cook and not in mood to order from outside. The recipe usually which I follow is very simple and quick... I will post that some other time. Cook green peas till done. Clean wash and cook rice in salted water till done. Take care that the grains remain separate. Rinse the cooked rice in cold water and drain again. Spread on a large plate to cool. Wash and finely chop tomatoes and onions. Finely chop ginger and garlic. Grind the cloves, cardamom, cinnamon and pepper coarsely. Heat ghee in the pan. Add the cashews and roast them till golden brown. Remove and drain them on tissue paper. Now in the same pan, add cumin seeds, and when they splutter add the coarsely ground spice mix. Sauté till they change colour. Add the chopped onion and fry for 2-3 minutes. Add the ginger garlic and sauté further for a minute. Add the tomatoes, salt and cook on medium heat for two minutes. Add red chilli powder, garam masala and cover with lid. Cook on low heat till the tomatoes are completely mushy. Add the cooked grean peas, cottage cheese, chopped coriander leaves and mix.Add the cooked rice and toss it gently and mix well. Cook till the rice is heated. Serve hot garnished with fried cashewnuts. Serve with your choice of raita.